Osteoarthritis is the most common form of arthritis people suffer from today. 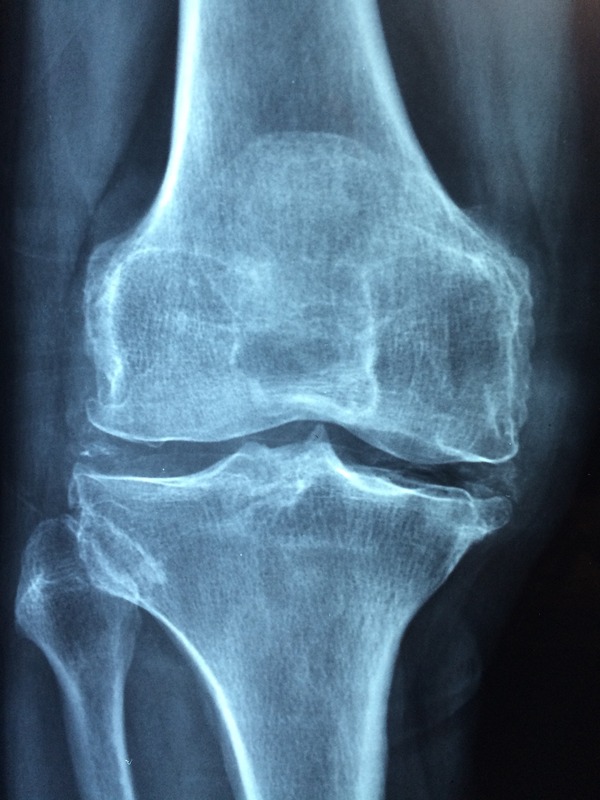 Knee osteoarthritis can a normal part of aging but can also develop because of a previous injury. The knee joint is composed of two bones, the thigh bone (femur) and the shin bone (tibia). On the ends of each these bones is a layer of softer tissue (cartilage) which protects the bone against daily wear and tear. The smooth cartilage also helps the bones move and glide easily. With age or injury, the cartilage at the end of the bones thins. Sometimes it becomes so thin that small pits or holes begin to form and the bone underneath the cartilage is exposed. This is what doctors refer to as “bone on bone.” Even when there are no holes in the cartilage, the thinning makes the once smooth surfaces rough and uneven. As the bones move to bend or straighten the knee, they rub against the rough surfaces which can lead to inflammation or swelling and pain. Orthopedic specialists will often try a series of injections to control the pain and minimize inflammation. Sometimes these injections are very effective and people get relief for long periods of time. However, others may get only short-term relief or none at all. It is usually at that point, they are referred to physical therapy. Physical therapy really does help. Many people wonder how physical therapy can help with osteoarthritis pain in the knee. After all, physical therapy does not change the condition of the cartilage or the surfaces of the bones inside the joint. While it is true that physical therapy will not make any changes to the thinning cartilage, therapy has been proven to greatly reduce pain. Not only that, but therapy has also been shown to return people to their normal lifestyle and activities. Since the goal of most people is to get back to enjoying their family, friends and hobbies, physical therapy is the perfect solution to many problems related to osteoarthritis. The thought of exercising to force movement in a knee joint with osteoarthritis may not seem like a good idea. Medical research reveals that an exercise program designed to strengthen muscles around the knee joint as well as improve balance and walking is very effective at reducing knee pain. However, not all exercise programs are equal. Three key factors need to be considered for a successful exercise program that reduces knee pain. 1. What types of exercises are safe and will reduce pain. 2. How much exercise is needed. 3. How intense each exercise should be. Physical therapists create appropriate exercise programs based on these key factors. They are highly trained experts who understand the disease of osteoarthritis and what is needed to properly treat the symptoms. They build individual exercise programs using evidence from research to guide the development of each program. Although a diagnosis of knee osteoarthritis can be a little scary, it doesn’t have to be. Millions of people diagnosed with osteoarthritis are living normal, happy and pain free lives. Osteoarthritis also does not mean that surgery is inevitable, not even if the X-rays and MRIs show “bone on bone.” Physical therapy has been proven time and again to improve symptoms and get people moving again. If you have been diagnosed with osteoarthritis and want to return to your normal activities, scheduling an evaluation with a physical therapist is a great first step. Call us today at 352-243-4422 to find out how we can help you avoid surgery and get back to your life.